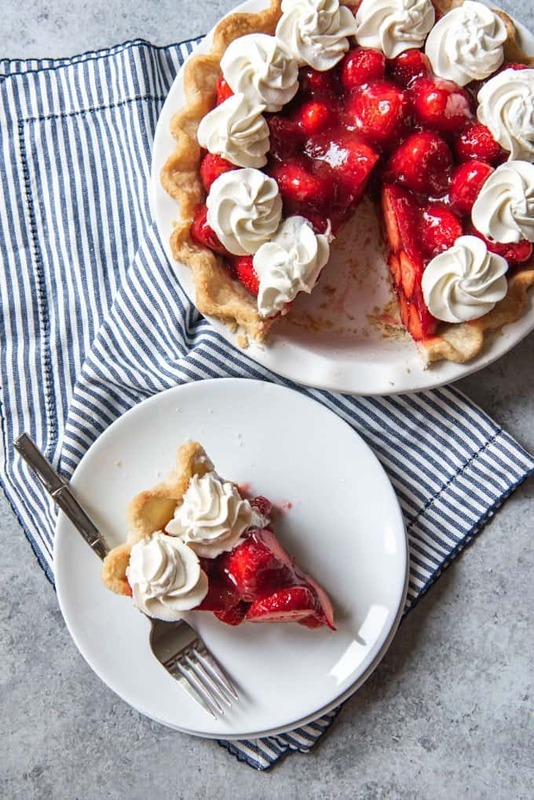 Make this Fresh Strawberry Pie without Jell-O before summer is over! 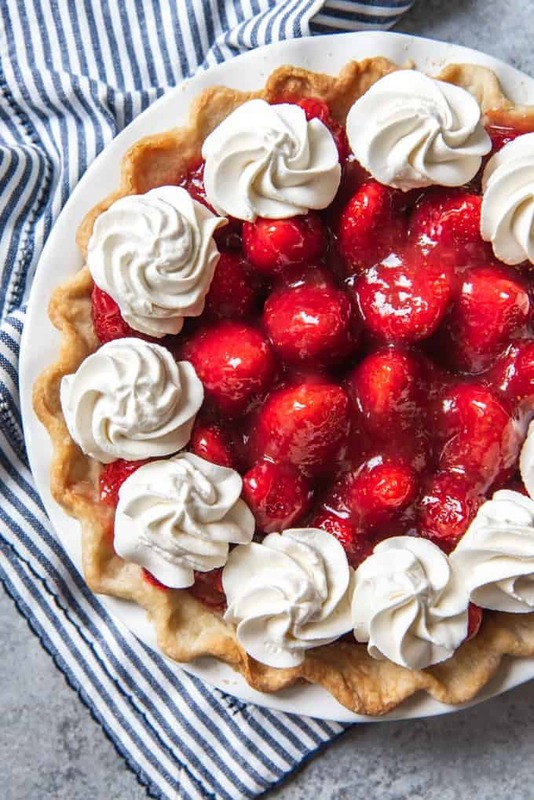 A classic buttery crust gets loaded with juicy, fresh strawberries coated in a strawberry glaze made from scratch and then topped with plenty of sweetened whipped cream. It’s so good! 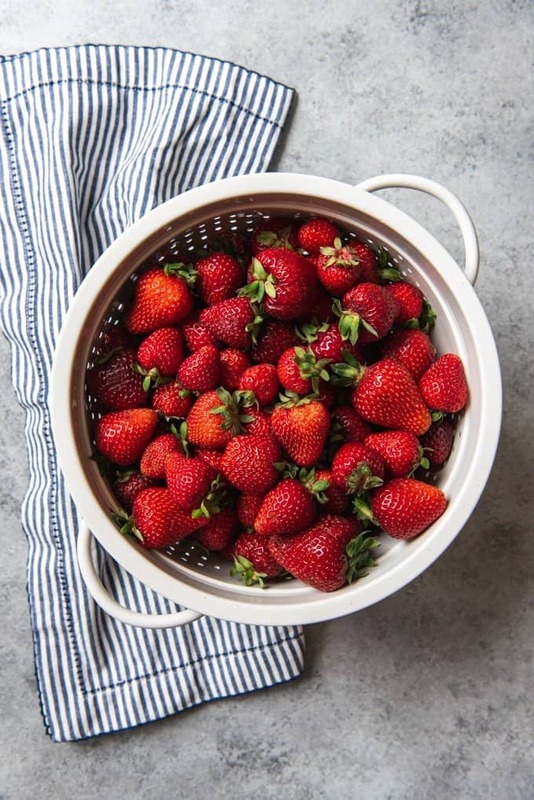 This simple dessert recipe is made with only delicious natural flavor from actual strawberries. I don’t have anything against Jell-O (I mean, there are quite a few classic Jell-O recipes on here like my favorite mandarin orange Jell-O and lemon pineapple Jell-O), but when it’s so simple and easy to make a homemade pie with plenty of strawberries drenched in a thick, sweet glaze from scratch, I’m more than happy to save my box of Jell-O for some other use. 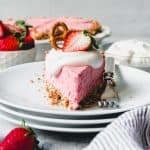 This fresh strawberry pie may have been made famous by restaurants like Shoney’s or Frisch’s Big Boy – they certainly are well-known for this beloved dessert that only comes around certain times of the year. 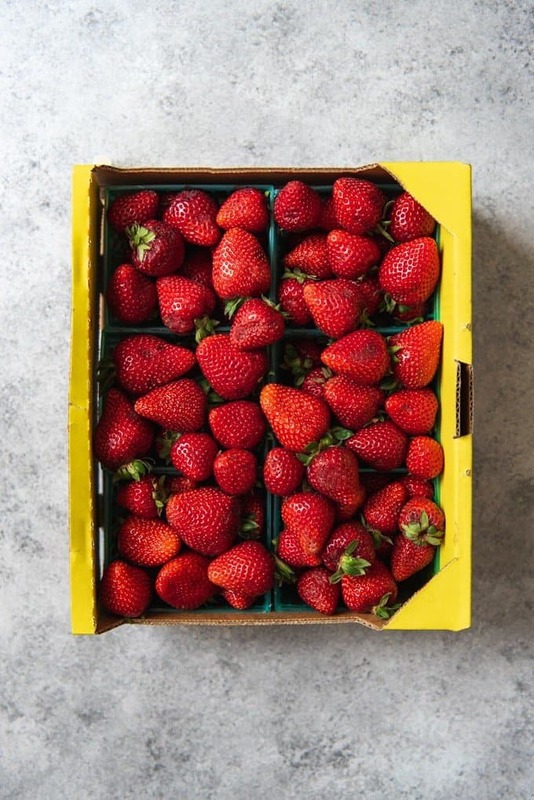 The seasonal spring or summer strawberries make all the difference and you just can’t get the same results with frozen berries. To make the strawberry glaze, just wash and hull one cup of strawberries and puree them in a food processor. You could also just blend them or mash them really well with a fork, if that’s what you have to work with. Then it is just a matter of whisking together sugar and cornstarch in a saucepan and adding the strawberry puree and water. Cook the mixture until it comes to a boil, then continue to cook, stirring almost constantly for three minutes until the glaze thickens and turns translucent. Cool completely before spooning over strawberries in a prebaked pie crust and chilling for 2 hours until the pie is set. I used my favorite single pie crust recipe and blind-baked until it was golden, but you could use a store-bought pie crust or go with a graham cracker crust instead if you prefer. 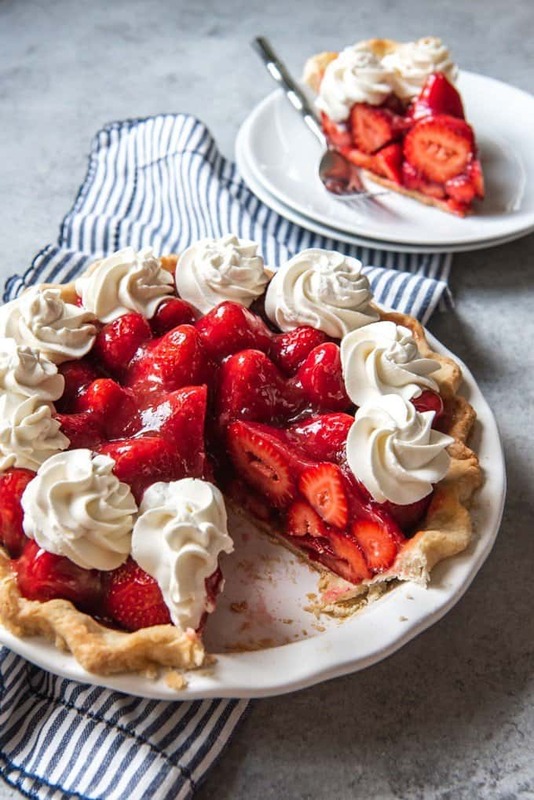 In a pie like this fresh, high-quality strawberries like the ones you get at the farmer’s market are definitely the way to go. Depending on the size of your strawberries, you may want to halve or even quarter them so they are easy to eat in the pie. 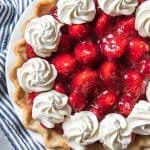 You can either arrange the strawberries in the pie and pour the glaze over them, or fold the strawberries into the glaze to make sure they get evenly coated. 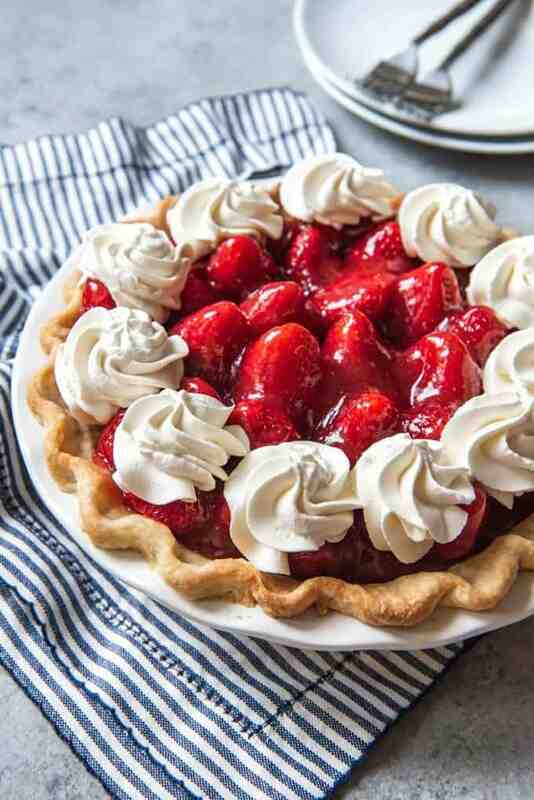 I usually take the latter approach, but for purposes of a prettier picture for this post, I arranged the strawberries first, then spooned the glaze over the top and jiggled it down into the pie. Both ways work. 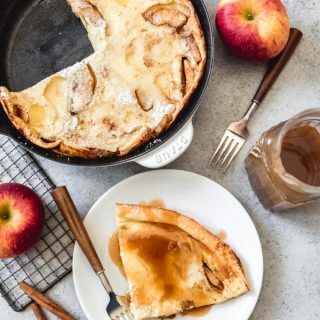 Definitely plan to eat this pie on the day you make it. The juicy fresh strawberry pie filling will make the prebaked crust soggy if the pie sits too long. I think it’s best within 3 hours of assembly. 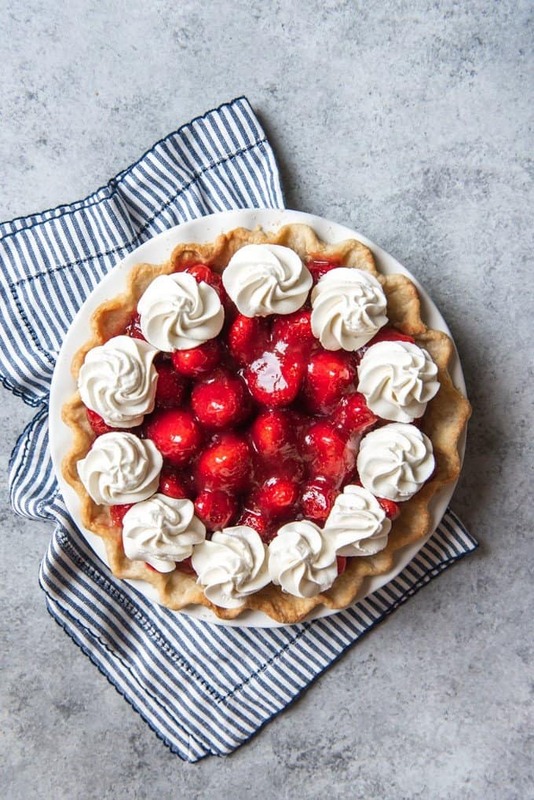 Keep the pie refrigerated until you are ready to serve it and be sure to top it with whipped cream for pure strawberry pie perfection! 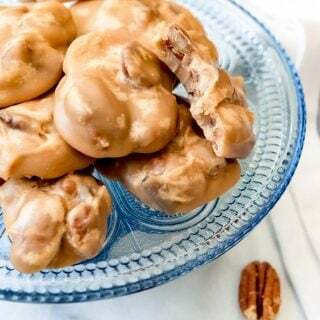 And keep scrolling for even more Farmer’s Market inspired recipes shared by some of my food blogging friends for Farmer’s Market Week! Make this Fresh Strawberry Pie without Jell-O before summer is over! 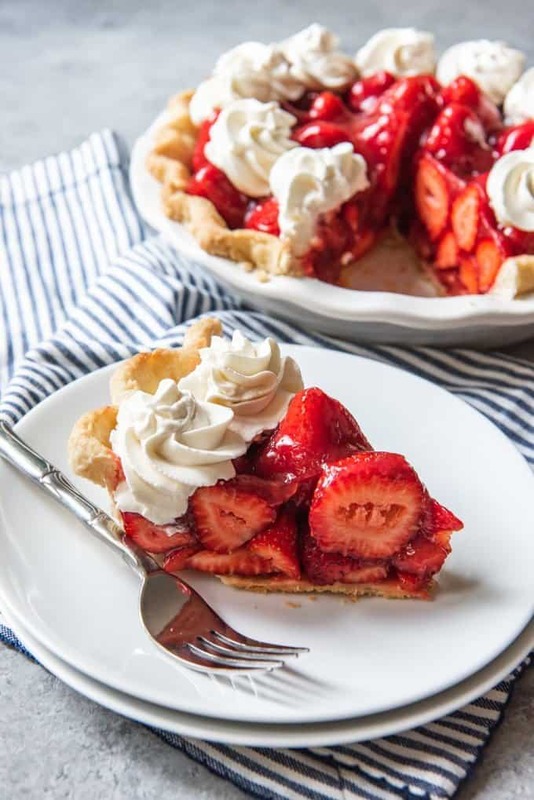 A classic buttery crust gets loaded with juicy, fresh strawberries coated in a strawberry glaze made from scratch and then topped with plenty of sweetened whipped cream. 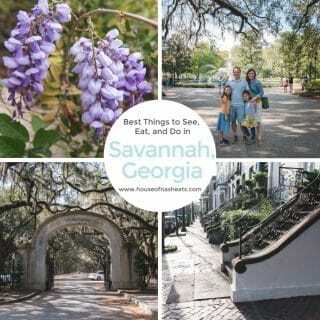 It's so good! 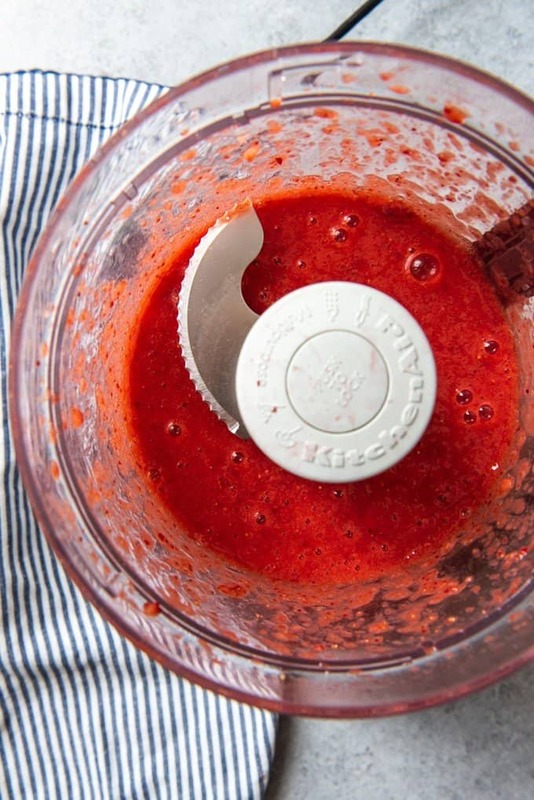 Puree 1 cup of the strawberries in a food processor or by mashing thoroughly with a fork. In a medium saucepan, whisk together the sugar and cornstarch, then add the water and strawberry puree. Bring to a boil over medium heat, stirring constantly. Cook for 3 more minutes, until the strawberry mixture turns thick and translucent. Set aside and let cool to room temperature. Blind bake the pie crust by rolling out the pie crust and placing it into a pie plate, trimming any excess and crimping the edges. Line the pie shell with a double layer of aluminum foil, covering the edges to prevent burning. Fill the shell with pie weights and bake at 375 degrees for 25 to 30 minutes until the pie dough looks dry and light in color. Then remove the pie weights and the foil and continue to bake until the crust is a deep golden brown, about 10 to 12 minutes longer. Remove from oven and cool completely, about 1 hour, before filling. Meanwhile, cut any larger strawberries in halves or even fourths and place in a large bowl. 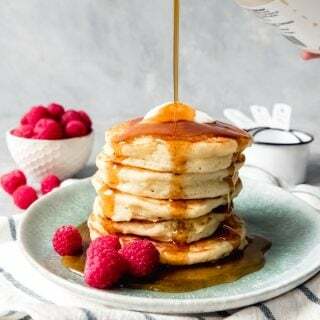 Add the glaze and gently fold with a spatula until the berries are evenly coated. 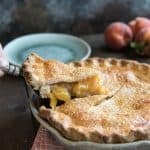 Fill the cooled pie crust with the strawberry pie filling, piling them into a mound and turning any cut sides to face down. 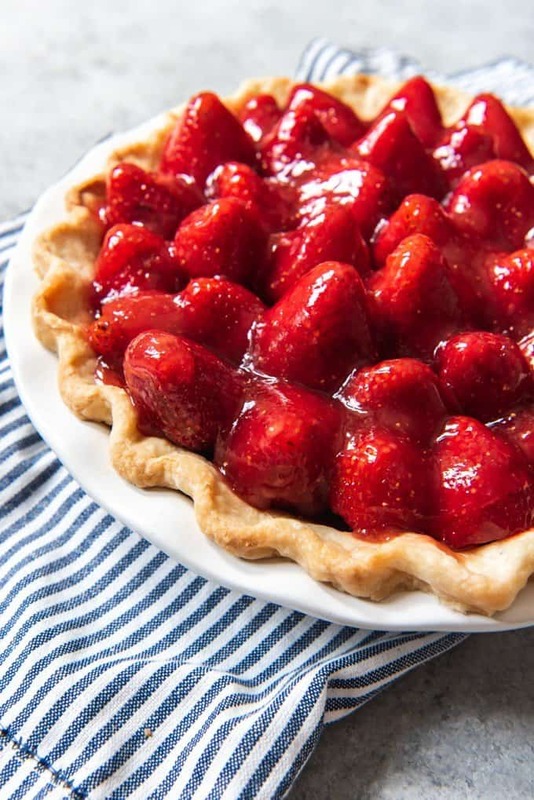 If you want a "prettier" pie, you can arrange the strawberries in the pie shell first, then spoon the glaze over the top. Chill for 2 hours until set. 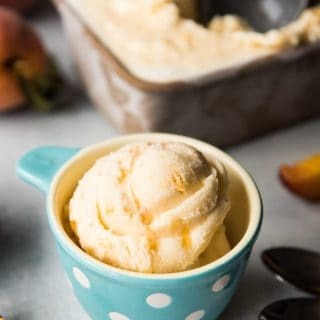 Prepare the whipped cream by beating the cream, powdered sugar, and vanilla with an electric mixer until smooth, thick, and nearly doubled in volume, forming soft peaks. Serve the pie with the fresh whipped cream within 5 hours of chilling for the best results. Fresh strawberry pie is one of my favorites. I have been wanting to make this pie forever! Looks like you hit the nail right on the head. Can’t imagine a better-looking strawberry pie!! 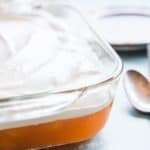 I love that this recipe doesn’t use jello! 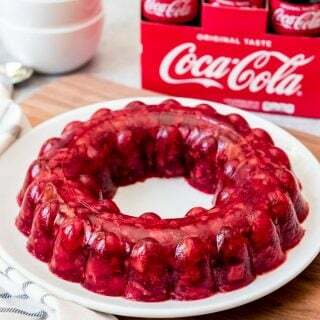 I always love the look of this pie, but the jello turns me off! 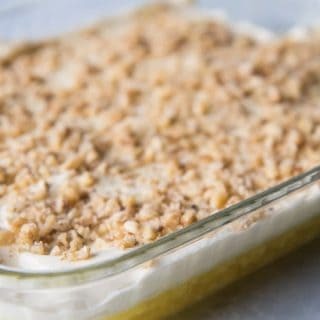 This is going to be a staple summertime dessert! 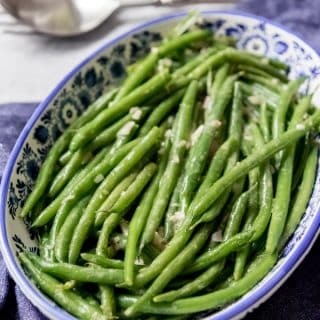 Do you think this would work with blackberries? Also, can tapioca work in place of cornstarch? Thanks!! Yes, I think this could work with blackberries. Although I don’t know that tapioca and cornstarch would work as substitutes in this particular instance. But I haven’t tried it and don’t use tapioca all that often, so I can’t say for sure.